Greece has no chance of meeting the target of reducing its debt to “well below 110% of GDP by 2022” set by the Eurogroup of finance ministers in November 2012. The Greek people are anarchic and difficult to tame. For this reason we must strike deep into their cultural roots: perhaps then we can force them to conform. I mean, of course, to strike at their language, their religion, their cultural and historical reserves, so that we can neutralize their ability to develop, to distinguish themselves, or to prevail; thereby removing them as an obstacle to our strategically vital plans in the Balkans, the Mediterranean, and the Middle East. Greece has missed the deadline for a €1.5bn (£1.1bn) payment to the International Monetary Fund (IMF), hours after eurozone ministers refused to extend its bailout. But the ministers say they will discuss a last-minute request from Greece for a new two-year bailout on Wednesday. The IMF confirmed that Greece had failed to make the payment, shortly after 22:00 GMT on Tuesday. The Greek government has announced that banks will remain closed on Monday and restrictions on withdrawals will be introduced following the ECB refusal to provide additional Emergency Liquidity Assistance to Greece’s banking system. “The Eurogroup’s decision prompted the ECB to not increase liquidity to Greek banks and forced the Bank of Greece to recommend that banks remain closed, as well as restrictive measures on withdrawals,” Greek Prime Minister Alexis Tsipras told the nation in his Sunday night address. It appears as though Tsipras is set to turn the tables by threatening to effectively put euro membership to a popular vote. The issue of timescale is relevant – since the referendum would take place after the repayment deadline, requiring the ‘creditors’ to agree to a bailout extension – which isn’t happening. In which case there would be no need for a referendum. For Tsipras it looks now as if the key question will rest on WHO gets blamed for a Grexident. As we watch the drama unfold – awaiting the ‘final curtain’ on 30th June 2015 (although I suspect there will be encores), for those who want to understand HOW this all came about – the film Debtocracy may help. “Debtocracy” seeks the causes of the debt crisis and proposes solutions, hidden by the government and the dominant media. It’s not just about Greece – this traces the social, economic and political factors globally – with an emphasis on Europe. A report in Germany’s Sueddeutsche Zeitung newspaper on Monday evening says European governments are ready to push for capital controls in Greece if there’s no deal this week. Other European countries can’t make that move on their own — there’s no institutional procedure for the rest of Europe locking down an individual member state. 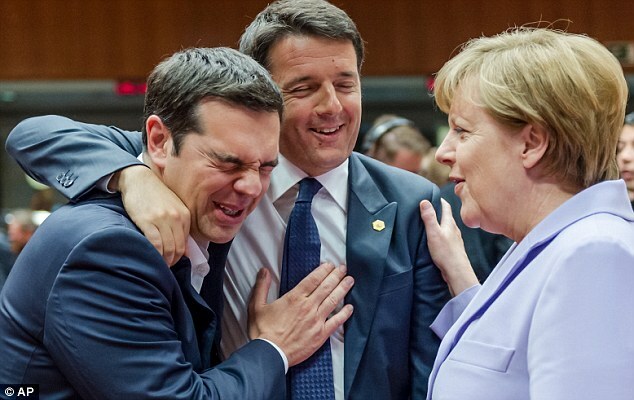 Greece would have to pass its own law agreeing to the move. Let’s see…a heavily-indebted country can’t pay its bills, engages in a long series of failed attempts to manage a partial, controlled default, sees most of its capital flee to safer venues, and then, in a final act of desperation, imposes capital controls. But it quickly realizes that it’s too late. Capital controls, to the extent that they ever work, have to be imposed by surprise, while there’s still some capital to control. If you wait until everyone expects them, the banks empty out in anticipation and you’ve locked a barn sans horses. Hundreds of lawsuits by Greek government bondholders in Germany had been on hold since 2013 pending the ruling. The bondholders argue that Greece in 2012 forced them to swap their securities with new government bonds of a significantly lower nominal value. While none of the claimants accepted Greece’s initial offer, the government carried out the proposed exchange. The EU court’s decision comes days before it is due to rule on another German case with the potential to send shock waves across the euro area. Judges are scheduled to deliver a verdict on whether ECB president Mario Draghi overstepped the mark with a 2012 bond-buying plan he designed to help save the euro.